GME completed a 12 month Pre-Feasibility Study (PFS) in August 2018. A review of the nickel and cobalt supply/demand outlooks, including the emerging battery raw materials demand from the EV market. The selected processing route (refer Simplified NiWest Process Flowsheet diagram) for the PFS involves heap leaching of NiWest ores followed by Pregnant Leach Solution (PLS) neutralisation, Direct Solvent Extraction (DSX) and product crystallisation to produce nickel sulphate hexahydrate (NiSO4.6H2O) and cobalt sulphate heptahydrate (CoSO4.7H2O). It is noteworthy that successful heap leaching of similar ores has previously been undertaken, at a commercial scale, at the nearby Murrin Murrin Operations. The choice of DSX, validated by extensive prior metallurgical test work, also presents a highly efficient and cost effective pathway to directly produce the nickel and cobalt products specifically sought-after by the high-growth EV battery manufacturing market. The chosen flowsheet and end product strategy is, in GME’s opinion, the most attractive processing and refining approach after taking into account NiWest’s specific ore characteristics combined with the technical and operating risks, relative capital intensity and final product value of various flowsheet and end product alternatives. 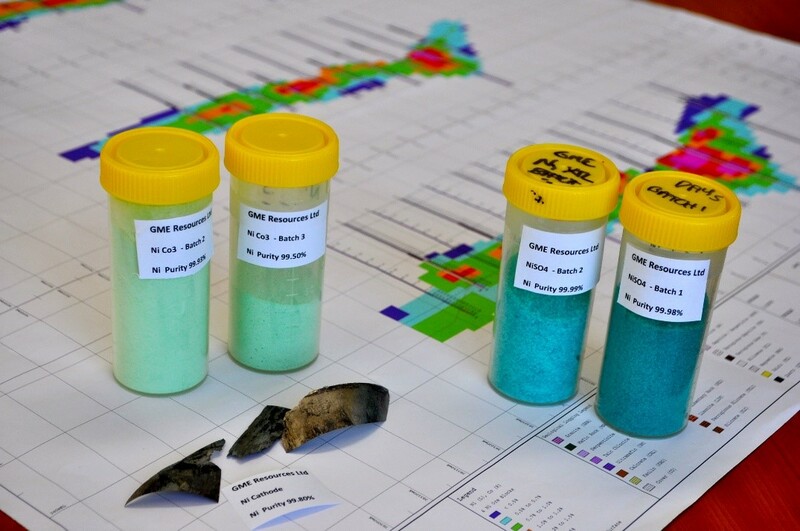 The PFS, including prior test work that commenced in 2013, confirmed that the proposed DSX process flowsheet can treat the NiWest neutralised PLS to generate pure nickel and cobalt electrolytes that can be tailored to the generation of multiple high purity nickel and cobalt products. Maiden NiWest Ore Reserve estimate of 64.9Mt at 0.91% Ni and 0.06% Co (for 592kt contained nickel and 38kt contained cobalt). Conventional open pit mining at a low projected strip ratio of 2.0:1. Head grades average 1.05% Ni and 0.07% Co for the first 15 years. Selected processing route of heap leaching followed by highly efficient Direct Solvent Extraction (DSX) to produce low-cost nickel and cobalt sulphate products. Initial 27-year operating life at a nameplate processing capacity of 2.4Mtpa. Projected steady-state nickel and cobalt recoveries of 79% and 85% respectively. Total production of 456kt nickel (in nickel sulphate) and 31.4kt cobalt (in cobalt sulphate). Average annual production of 19.2kt nickel and 1.4kt cobalt over the first 15 years. Project construction period of 24 months from Final Investment Decision (FID). Forecast commissioning and plant ramp-up phase of approximately 20 months. Life-of-mine metal price estimates of US$8.00/lb nickel (includes US$0.75/lb sulphate premium) and US$25/lb cobalt (zero sulphate premium). A$/US$ assumption of 0.75. Ungeared post-tax NPV8% of A$791M and internal rate of return (IRR) of 16.2% (equivalent pre-tax values of A$1,390M and 21.2%, respectively). Payback period (pre-tax) of 4.4 years. Average cash unit operating cost (post royalties and cobalt credits) of US$3.24/lb contained nickel (US$3.00/lb for the first 15 years). Forecast pre-production capital expenditure of A$966M, representing a globally attractive pre-production capital intensity of sub-US$20 per pound of average annual nickel production. Projected free cashflow (post all capital expenditure and tax) of A$3,342M.